After the turn of the last century, the growth of tourism in the American Southwest brought enormous changes to the still young tradition of Indian jewelry making. 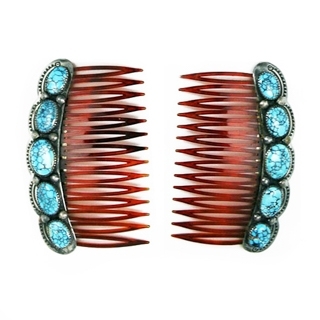 Traders saw Native jewelry’s great potential as souvenirs because the designs were distinctive, turquoise already was associated with the Southwest, and jewelry was easy for the traveler to pack and carry. Silver forks, spoons, boxes, letter openers, copper trays, hair combs and buttons were both useful and decorative items small enough for tourists to take home. Ambrose Lincoln - Navajo Turquoise and Silver Hair Pin c. 1940s, 1.125" x 2.25"
F. L. Begay - Navajo Sandcast Sterling Silver Letter Opener with Yei Figure Design, c. 1960s, 5.25"
F. L. Begay - Navajo Sandcast Sterling Silver Letter Opener with Yei Figure Design, c. 1970s-80s, 3.75"
John Gordon Leak - Zuni Turquoise, Jet, and Sterling Silver Post Earrings with Dancer Figure c. 1940s, 1.25" x 0.75"
Navajo Bisbee Turquoise and Silver Cuff Links c. 1950, 0.625" x 1"
Navajo Blue Gem Turquoise and Silver Tie Clip, circa 1950-60s, 0.5" x 0.75"
Navajo Copper Tray, circa 1930s, 3.5" x 4.5"
Navajo Handwrought Silver Hair Pin, c. 1950s, 4"
Navajo Lander Blue Turquoise and Sandcast Silver Letter Opener, c. 1970s, 7.5"
Navajo Miniature Silver Box, c. 1930s, 0.5" x 1.4" x 1"
Navajo Red Mountain Turquoise and Silver Barrette, circa 1940s, 1.125" x 3.125"
Navajo Silver Collar Tab / Button, c. 1920s, 0.75" x 2.25"
Navajo Silver Collar Tabs, c. 1930s, 3" x 2"
Navajo Silver Letter Opener, c. 1900s, 6.5"
Navajo Silver Spoon with Single Turquoise Stone, c. 1910, 6"
Navajo Silver Teaspoon with Stampwork, c. 1900-20s, 7.875" x 1"
Navajo Silver Teaspoon with Stampwork, c. 1900-20s, 8" x 1"
Navajo Silver Teaspoon with Stampwork, c. 1900-20s, 8.25" x 1"
Navajo Silver Teaspoon with Stampwork, c. 1900-20s, 8.375" x 1"
Navajo Stamped Silver Spoon with Arrow and Owl Design, c. 1900 , 5"
Navajo Stamped Silver Spoon with Arrow and Owl Design, c. 1900, 5"